Project TALK was founded on the belief that every child with hearing loss should have the opportunity to learn to listen and to talk. In order to achieve this goal, Project TALK strives to ensure that every child with a hearing loss has access to the highest quality of audiological, speech, and educational care. Our staff is dedicated to providing the highest quality of care in a fun, child-centered atmosphere. All our audiological testing, hearing aid services, and cochlear implant services are designed to ensure our patients, not only receive optimal benefit, but also thrive under our care. Currently, our dedicated staff serves over 450 families from California, Arizona, Idaho, and Utah. We even have families who travel from as far as Massachusetts, Virginia, Florida, Alaska, Mexico, South America, Europe, and the Middle East so that their children may have the highest quality of services available. We also provide education, consultation, and evaluation to professionals and school programs throughout the country. 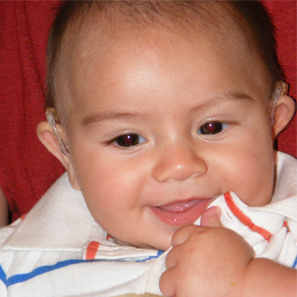 Project TALK's licensed and board certified pediatric audiologists specialize in diagnosing and treating infants and children with hearing loss. Utilizing the most advanced technological developments in digital hearing aids and cochlear implants, our audiologists are committed to ensuring that every child with hearing loss is given the opportunity to maximally benefit from his/her amplification. Our audiologists have garnered experience in a wide variety of settings including: auditory/oral school settings, public schools, medical offices, and hearing aid dispensing offices. Building upon their professional experiences, their extensive knowledge and training, and their love of children, our audiologists are dedicated to providing the highest quality of services in a fun, child-friendly environment.